BLAST! 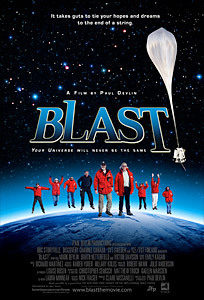 is an intriguing documentary about a team of astrophysicists who travel to both poles in an effort to launch a massive telescope from a hot air balloon to discover more about the origins of the universe. The film originally premiered at Hot Docs in 2008 and is airing in Canada on the Discovery Channel on Friday February 21st at 7:30pm EST. a movie about a scientific project but it is also about learning through trial and error, about what we know and don’t know about the universe, and also a smattering of faith in science. I respect the opinions of both of these women, and therefore I’m looking forward very much to seeing BLAST! If you’re at all interested in seeing real scientists at work, and wondering about the curiosity that drives them to the ends of the earth in search of knowledge, you won’t want to miss this broadcast. This entry was posted in Documentaries, Television and tagged antarctica, arctic, canada, faith, physics, science. Bookmark the permalink.